We have been ranked by Hitwise as a Top 10 Website in the Gifts & Flowers category for six years running now. The annual Hitwise UK Online Performance Awards recognise excellence in online performance through public popularity, awarding websites in more than 50 key industries online. As Hitwise reports on the anonymous online usage and search behaviour UK Internet users – the largest online sample of its kind - this unique awards programme recognises excellence in online performance through public popularity. GettingPersonal won the Manchester Evening News Young Business of the Year Award back in 2008. Each year, the judges look for ‘bright young things of the north west business world’ to win the award and it’s open to companies within the M.E.N circulation area and who have been trading 3 years or less. To be recognised in these prestigious local awards back in 2008 when we were such a young business was an achievement we were, and still are, hugely proud of. Fast Track 100 Awards - Customer Services & Wow Customer Services awards. We always have been and always will be fanatical about customer services. 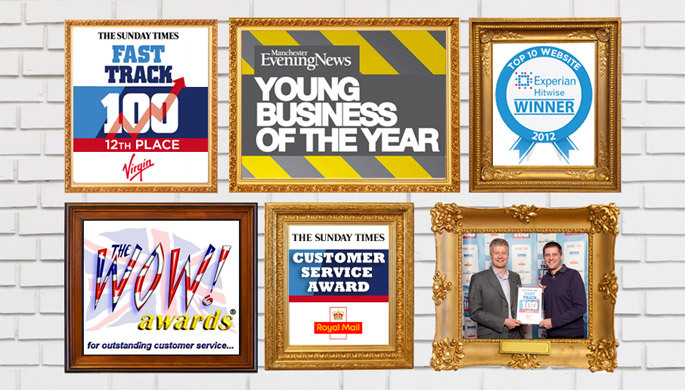 Our team works really hard to ensure our customers are well looked after and these awards as well as over 100,000 ‘Customer Smiles’ recognise that hard work.